Give your customers the benefit of energy savings and dependability. Reliant is one of the largest Texas electricity providers. When considering which electricity provider to choose, more than 1.5 million Texans turn to Reliant. Their Fortune 200 parent company is NRG Energy, Inc. Together, they are leading energy innovation and working to simplify and enhance the way you power your home, your business and your life on the go. As an NRG Authorized Retailer, you’ll be able to provide your customers with service that exceeds their expectations. What can you offer as a NRG Authorized Retailer? 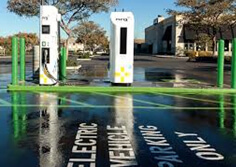 Reliant partnered with Houston and Dallas in 2009 to bring the first public electric car charging stations to the city and promote the adoption of electric vehicles. 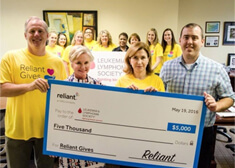 Reliant donates $115,000 to employee-nominated charities 3 times per year. Public voting determines which charities receive $100,00, $10,000, or $5,000 each quarter. 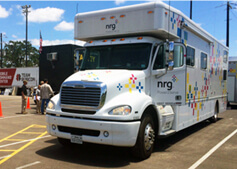 NRG's mobile power support vehicle provides power and hands-on support to aid people who have been affected by natural disasters. 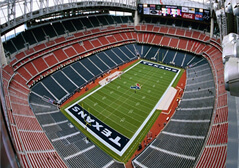 As a trusted brand, Reliant powers the Reliant Stadium, AT&T Stadium and the Toyota Center. Empowering customers to better manage their electricity usage and cost with innovative plans, products and services. Delivering award-winning customer service and support 24/7, online or by phone. Leading the nation in bringing innovative, smart energy solutions to customers. Providing 23 million MWh of power annually to retail customers in the U.S. Supplying competitive pricing to U.S. businesses as the largest commercial and industrial retail electricity provider in Texas. RS&I currently serves the Texas area, but will soon serve additional areas in Illinois, Ohio, Pennsylvania, New York, Maryland, Delaware, New Jersey, and Massachusetts. Our NRG Retailers have access to our Dallas and Houston locations for sales and distribution support.